Sardinian Arts was born out of great appreciation and respect for the art of handweaving, Sardinia, and the tessitori artigianali, the women who maintain the art of traditional Sardinian handweaving. As you see from reading through the website, the textiles here are made one at a time by the hands of weavers who put their heart into each fiber of every weaving. This care and attention imparts a tangible energy into each weaving — and it’s this indescribable essence that makes the textiles so indescribably unique and rare. If you seek to bring this essence into your life and your home, I offer you a connection to the integral spirit and beauty found in the traditional Sardinian handwoven textiles. I can help you find and bring the right textile into your life, provide your group or weaving guild a private showing and discussion of my the short film, I Want to Weave the Weft of Time, organize a small show or a larger exhibition of Sardinian textiles, bring you on a tour of Sardinian weaving studios — or just talk with you about Sardinia! As a kid, I loved textiles and fabrics. My mother was a remarkable seamstress who designed and made her own clothes and could construct anything with fabric. She occasionally ventured into related fiber arts, including weaving, which fascinated me. When I went to college to pursue a degree in design, my favorite classes were weaving and fiber arts, taught by Gayle Wimmer, an internationally respected artist who had lived and worked with handweavers in Poland, Israel, France, and Italy. Studying with Gayle increased my love of textiles and the art of weaving. My appreciation of handweavers — primarily women — grew tremendously. Despite my love of textiles, I knew living the life of handweaver was not my path. For many years I admired fine weaving from a distance, not really creating or collecting textiles, yet appreciating and encouraging fiber artists in quiet ways. I very clearly remember one day having an epiphany: I wanted to invest in high-quality textiles, and, perhaps more importantly, support the women weavers who make textiles in traditional fashion, working in their homes or small studios — a diminishing number of artists who are increasingly rare. The concept was clear, but I wasn’t certain exactly what a plan would encompass, or how to go about realizing it. The idea seemed like something to pursue at some undetermined time in the future. The idea of working with women handweavers certainly wasn’t on my mind when synchronicity and grace led me to Sardinian textiles, my first encounter with a Sardinian weaver, and the gold standard of the tessitori artigianali. Serendipity has continued to guide me in this work of love: to recognize and honor the master weavers, to educate people about a wonderful yet little-known art, and to bring expertly-crafted textiles of Sardinian master weavers to a wider audience, so the textiles can live even if — when — the tradition fades. Thanks for visiting the site, and please contact me if you care to chat! 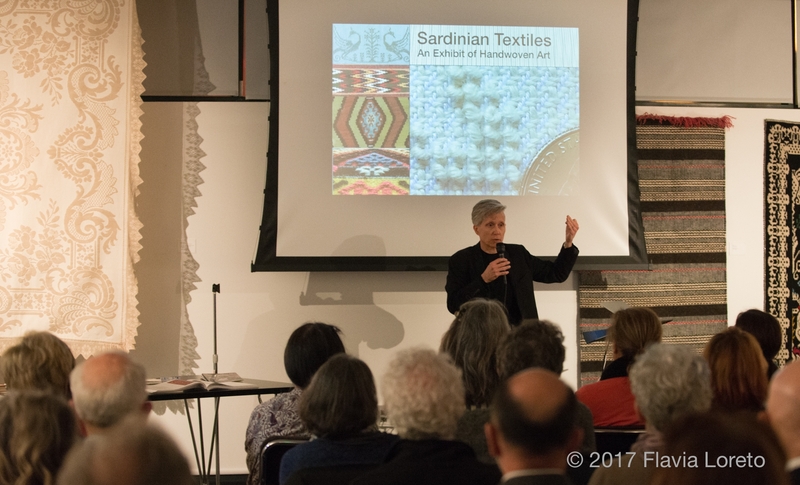 Thanks to Flavia Loreto for her photograph, from the show of Sardinian Textiles held at the Italian Cultural Institute – San Francisco in 2017.